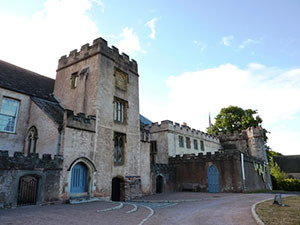 Torre Abbey, Torquay is the Torbay area's most historic building. It is Grade I listed and a Scheduled Ancient Monument. Founded in 1196 as a monastery it was by the late 1400's the richest Abbey in the whole of England. While the Abbey was in existence in all its splendour Torre Abbey built the harbour. Well they needed one, their landholdings were great and those lands produced food that had to be sent elsewhere. They were also responsible for obtaining a charter for a market town at Newton Abbot for the same reason. Many of these old houses had a secret chapel and so did Torre Abbey. Henry VIII had his say and Torre Abbey was demolished like so many more in 1539. Parts were retained as a private house. The Cary family, who lived there for 300 years established it as it is today. 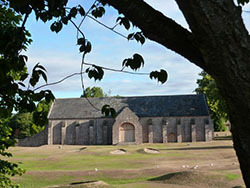 You can visit the medieval ruins of the original abbey. Torre Abbey was bought in 1930 by the local council and it became the Art Gallery and Mayor's Parlour. Now open to visitors this historic old Abbey is a lovely attraction in the centre of the town. Pretty big - it has over a hundred rooms, on 20 different levels and with masses of steps - over 250! However there is disabled access to most of it, from the visitor entrance and cafe, level access to the undercrofts and a glass lift for most of the rest. If you enjoy gardens this makes a pleasant respite. 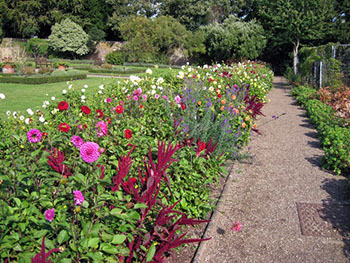 There are massed dahlias - quite a sight! Then there are the rare shrubs and lovely roses. Of course as this is an Abbey there has to be a lot of herbs. Even in poorer weather there is the Palm House full of palms of course, cactus and tropical plants that housed can grow in the Riviera climate of Torquay. Torre Abbey holds Torbay's large art collection. It already owns about 600 artworks and is still collecting. Is so named as it housed prisoners from the Armada, was a medieval tithe barn. There is said to be a ghost – that of a woman disguised as a sailor, who was rescued from one of the ships. The barn is now the home of temporary art exhibitions. Or you may like to browse some more, there are navigation buttons above on the left for your pleasure.